TWIN YANMARS / 960 HRS / ELECTRONIC CONTROLS / 2014 ELECTRONICS / VERY, VERY NICE! A BEAUTIFULLY-DESIGNED, SUPERB RIDINIG OFFSHORE FISHING PLATFORM. THE 34 WHALER DEFIANCE IS A PREMIUM EXPRESS FISHERMAN WITH A NUMBER OF INNOVATIVE FEATURES. SHE IS BUILT ON A DEEP-V HULL WITH PLENTY OF BEAM AND WIDE, SPRAY-DEFLECTING CHINES. LIKE OTHER WHALERS, FOAM BETWEEN THE INNER AND OUTER HULLS MAKES HER UNSINKABLE. SHE HAS A RAISED BRIDGE DECK WITH A CENTERLINE HELM AND FLANKING SETTEES. TO ACCESS THE ENGINES HER ENTIRE BRIDGE DECK SLIDES AFT ON ROLLERS RATHER THAN LIFTING MAKING ENGINE ACCESS EASY EVEN WHILE UNDERWAY. THE EXHAUST IS EXPELLED BENEATH THE HULL WHEN RUNNING. SHE HAS A LARGE SINGLE LEVEL COCKPIT WITH ANOTHER NEAT FEATURE A SLIDING TRANSOM DOOR. "FISH TALES" HAS HAD MANY UPGRADES AND IS IN EXCELLENT CONDITION. SHE IS POWERED WITH THE OPTIONAL YANMAR 420 HP DIESELS THAT WILL CRUISE HER AT 26 KNOTS. HER CURENT OWNER HAS HAD GLENDINNING ELECTRONIC CONTROLS INSTALLED. SHE HAS A WESTERBEKE 5KW GENERATOR, COMPLETE UPDATED ELECTRONICS, MOST INSTALLED IN 2014. SHE HAS A MARLIN TOWER AND ALL FISHING EQUIPMENT TO SATISY THE TOURNAMENT ANGLER. SHE HAS A SPACIOUS, WELL-FINISHED CABIN THAT WILL ACCOMODATE FOUR COMFORTABLLY FOR OVERNIGHT FISHING TRIPS OR FAMILY CRUISES. Contact Listing Broker Charlie Beres, Jr at (732) 278-9299 (Cell) for additional information or to schedule an appointment to preview the boat. Email address is - charlie@brightwateryachts.com . Clean late madel trades considered. International shipping available. A spacious, upscale cabin with accommodations for four. Located forward is an offset double berth, a hanging locker, drawer storage and an overhead ventilation hatch. To starboard is a booth style dinette which converts to a double berth. There is storage under and also gunwale storage cabinets and an enclosed rod locker. Located aft to starboard is the enclosed head which features a vanity with sink, a vacuflush toilet, a stall shower with seat, a medicine cabinet with mirror, storage lockers and an opening port. The entire cabin has maple cabinetry, ultra-leather fabrics and a teak and holly sole. She is spacious, comfortable and clean. Located aft to port, the galley features a round stainless steel sink with a Corian cover, a Kenyon dual burner stove with a Corian cover, a full size Norcold refrigerator/freezer, a GE microwave, dishware storage and plenty of drawers, cabinets and lockers for storage. 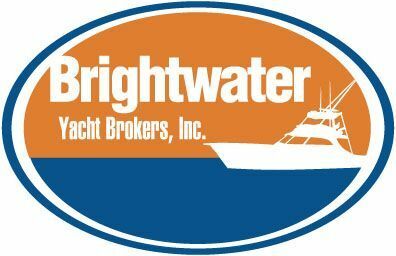 Другие яхты Brightwater Yacht Brokers Inc.
Посмотреть все яхты Brightwater Yacht Brokers Inc.